My life before COR Retreat was a constant roller coaster ride with food and diets. From the time I was a small child, I was always thinking about food and the comfort it gave me in all situations. I loved it when I was happy, sad, lonely, mad or stressed. It always helped me to feel numb and to not have to deal with my real emotions. I was able to control my weight, for the most part, until I was about 25 by over exercising and restricting food at some points in my life. At the age of 25, I went to my first Weight Watchers® Meeting. 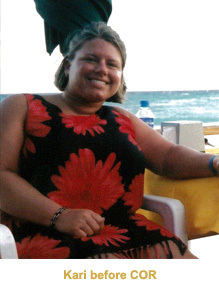 I gained and lost the same 50-60 lbs over and over for the next 12 years. As quickly as I could lose the weight in 3-6 months, I could also put it right back on in a few short months! With each passing year, I continued to obsess more and more about food all day long. I was as sick mentally about food as I was physically with my weight on a constant yo yo. I couldn't understand why I could control all other parts of my life but I had no control when it came to my obsession with food. I saw a story about COR Retreat on a newscast one night and I felt as if they were speaking directly to me about food addiction. 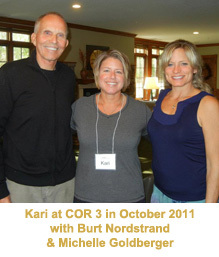 I signed up immediately and was so excited to attend the retreat in October 2011. My experience at COR Retreat was absolutely life changing! From the moment I walked in the front doors and was greeted by past COR alumni, I felt that I was home. They welcomed me with open arms and showed me the way to a new life — a life free from the obsession with food. I had 5 days to detox from sugar, white flour and my trigger foods. I was able to set my old ideas aside about diet and nutrition, and be open to having a new mind. I was able to work through the first 3 steps of recovery from food addiction while I was there. I came to believe that I was powerless over food. I also learned that food addiction is a disease process and has nothing to do with willpower. I found that there is a power greater than myself that can guide me down my spiritual journey. COR has given me the gift of living the life I always dreamed of. COR gave me the tools to a life that is manageable — a life that is happy, joyous and free! After leaving COR, I utilized all of the tools given to me (food plan, prayers and meditation, living by the 12 steps of recovery, attending support meetings, contact and fellowship with other people in my program, journaling and action plans). I have found a life filled with peace and serenity. I continue to live my life one day at a time. I work on making progress each day in my program and not focusing on perfection. I have found a whole new life mentally, physically and spiritually. My relationships with family and friends have become more positive as I continue to work on myself and learn to live within my own healthy boundaries. Since leaving COR, I have lost 55 lbs. My blood sugar, cholesterol, weight and BMI are in a very healthy range. It feels amazing to be at my goal weight but it feels even better to have the obsession from food removed. I now go back to COR each month and volunteer so I can help others who are still suffering. I feel so blessed that COR saved my life and has given me a fresh start.